Fr. Ephraim Alkhas completed a Masters of Arts in Philosophy as well as a Master of Arts in Theology from the Dominican School of Philosophy and Theology in Berkeley, CA. He is a priest in the Diocese of California serving as the sole dedicated servant in the Commission on Inter-Church Relations and Educational Development (CIRED). Fr Ephraim’s thesis, which was applied towards both degrees, is titled: Philosophical Terms and Anthropology in the Christology of Mar Babai the Great and Saint Maximus the Confessor. This thesis studied how philosophical language was used in Greek (by Maximus the Confessor) and in Syriac (by Mar Babai the Great) to describe the person of Jesus Christ as both fully God and fully man. Today, Fr Ephraim continues serving CIRED and in the Diocese of California. He is also in his second year of graduate studies at the University of California Berkeley’s Department of History. Primarily concerned with how canon law functioned in the creation of Christian societies, Fr Ephraim is interested in the development of Church of the East canon law from its sources in Roman (Byzantine) church councils and collections of church law texts. As a Ph.D. student his primary field is Byzantine Studies. Fr Ephraim’s prior education includes an M.Div. from Saint Vladimir’s Orthodox Theological Seminary in Crestwood, New York, and a B.A. in Spanish Literature from California State University Northridge. He is also a member of the Assyrian delegation in the official Russian Orthodox-Assyrian Church of the East Bilateral Dialogue. Deacon Emmanuel as born in Modesto, California, on May 15, 1986. He graduated from Beyer High School in 2004, and graduated from the University of California at Davis in 2008, with a major in communication. He was ordained a deacon on November 20, 2011 by His Grace Mar Awa at Mar Zaia cathedral in Modesto. He was tonsured as a monk-deacon on November 30, 2012 by His Grace Mar Awa, and was incardinated into the Monastery of Mar Isaac of Nineveh, Modesto. He began his theological studies at the Dominican School of Philosophy and Theology in Berkeley, California in 2014. 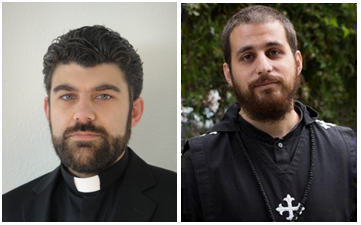 After two years of studies, in September of 2016 he successfully defended his Master’s Thesis (with honors) titled: “A Study of Mar Narsai’s Three Homilies on the East Syrian Liturgical Season of Annunciation. He received the degree of M.A. Th. The thesis is a study which focuses on Mar Narsai’s teaching on Divine Revelation, and what role Divine Revelation played in God’s Divine Dispensation (Mdabbranutha). A large portion of the study focuses on the person of Abraham since his role in the Divine Dispensation is of utmost importance in Mar Narsai’s teaching. Mar Narsai presents a history of the world in which God makes a gradual revelation of his own person, while at the same time causing the receivers of this revelation to undergo a transformation. This revelation and transformation find a climax in the coming of Jesus Christ. He stands as the culmination of a long history of revelation and in him we also see the fullness of man’s transformation, the resurrection. Thus, Mar Narsai presents a theological world-view which places Jesus Christ as the object of all revelation which came prior to him, and the object from which all revelation proceeds after his coming. He intends on eventually publishing full translations of these homilies. Deacon Emmanuel serves the Diocese of California in its various needs. At present, he is working on an English edition of the liturgical Psalter of the Assyrian Church of the East, and further translations of the works of Mar Narsai into English.